The Slice of Life is Coming! For the past 3 years, during the month of March I participated in the Slice of Life Challenge hosted by the Two Writing Teachers blog. Every day I write and post to my LitCoachLady page a ‘slice’ of my life…a poem, a memory, a small moment. It’s not always easy, but it is always rewarding. Having some experience with it for a few years now has helped me realize that preparing some things ahead of time can make the challenge less challenging. I noticed yesterday my friend and fellow slicer, Leigh Anne Eck, was also preparing ahead of time. This early prep can give you a structure to build on each day, some ideas in the can for those hectic days, and as a way to commit (and avoid writer’s block). This year I’ve decided I will be writing each day to a spark from my new book Spark! Quick Writes to Kindle Hearts and Minds in Elementary Classrooms. I’m going to walk the talk of a writing teacher, “Do as I do, not as I say.” I’ve bookmarked 30 sparks, but I’m giving myself the option of choosing others, or to respond authentically to events that pop up in my life that inspire me to write. This always helps me to walk through my day more present-knowing anything and everything has importance enough to write about. So how can YOU prepare for the SLICE OF LIFE CHALLENGE and make the month of March a little less challenging? Here are some tips, I’d love to hear any others. Visit the Slice of Life Challenge overview page and the participant information form. Create a blog page if you don’t already have one. I use WordPress (you can get started HERE) but there are others Wix, Weebly,etc. This is a good resource on HOW TO START A BLOG. Read slices from other slicers (think ‘mentor texts’). You can see some of mine HERE. Try writing a few slices between now and March 1st. Save these as drafts on your blog site. Use these on those hectic days that will inevitably challenge you. Don’t worry about being lengthy and lush…remember other slicers are trying to read at least 3 posts each day and we often appreciate brevity! I’m not great at self promotion, but I’m proud of the quick write ideas I’ve put together in my new book and these might provide some SPARKS for you as well! Go to Twitter and search #SOL19. There you’ll find other slicers you can follow and get support from. It’s truly a community event, so welcome to the community! Shared Spark! This week I’ll share a few teacher quick write SPARKS to perhaps get you started on some slices. Just write for 5-10 minutes on whatever comes to mind. Try not to filter your thoughts or overthink it. Just let your ideas flow onto the paper without judgment. It can be fun to see what emerges! Reframe a situation in your day or week that revises the narrative more positively, yet honestly. What do you think school looks like through the eyes of one of your students? Whatever approach you take, I just hope you take the Challenge! It will change your perception of writing profoundly and permanently…I guarantee it! UPDATE: I will begin blogging every day in the month of March for the #SOL17 (Slice of Life Challenge) I won’t be posting about teaching pedagogy, instructional ideas, or book recommendations. Rather, I’ll be sharing “slices” of small moments, poems, photos, that reflect what is important or ‘in the moment’ for me in the month of March. I’ll go back to my regularly scheduled blogs once a week in April. If you’d like to “slice” I have information in this post to help get you going! 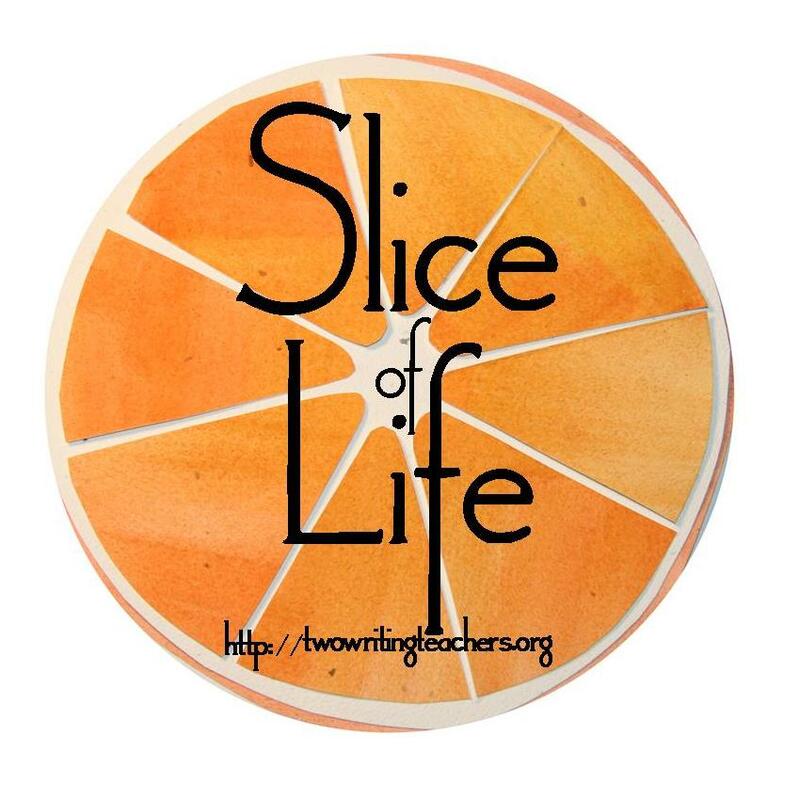 This March marks the 10th year of The Slice of Life Challenge hosted by Two Writing Teachers. The idea is to write a small “Slice of Life” every day in the month of March. The Two Writing Teachers believe, “Teachers who write regularly can better support the students they teach in writing workshops daily.” I couldn’t agree more. Last year was my first in attempting this challenge and I have to say it was truly a ‘game changer’ for me. Knowing that I would be writing a little each day not only kept my skills sharp and my ideas flowing, but I began to frame experiences as stories. Everything around me suddenly became seeds for writing. I saw my world in a whole new way-I began to appreciate others’ experiences with greater clarity and compassion. I lived a writerly life! I strongly encourage every teacher I know to give this challenge a try. You may not be able to write every single day, but even if you wrote several times a week I guarantee you will think about writing with such a different perspective. You will see the writers in your classroom with greater appreciation and empathy. The big idea is that you write about what is important to you: a moment in your day, a memory from your past, a poem, a short story, a collection of words or images that expresses a “slice of your life”. Then you post it on your blog and post the link on the Two Writing Teachers Blog (https://twowritingteachers.org ) so that other slicers can read and comment on your posts. You also agree to read and comment on at least 3 other slicers writing each day. That way you are truly part of a writing community! Believe me, you will love getting feedback from others! First Time Slicers CHECK OUT THIS LINK that goes live on Feb 20. Write some slices ahead of time- there will be days you can’t carve out 10 minutes to write, I get that. Have some slices ready to go that you can quickly post. Don’t quit if you miss some days-sure writing every day is great, but living a writerly life is a greater goal! Invite some of your friends to take the challenge with you. We all know that accountability partners help us with our goals. Read other “Slices” for inspiration and ideas-it’s probably not as daunting as you might think when you can see what it looks like. If you are a nerdy teacher like me you have probably been waiting with baited-breath for this resource! Just like her companion text The Reading Strategies Book, Jen Serravallo has compiled an amazing series of lesson ideas to meet the needs of of literacy learners from K-8. She builds off the work of Lucy Calkins and Carl Anderson to offer concrete and specific teaching points to move writers forward. A ‘must-have’ resource for writing teachers! I also think this could be a great resource for SLICERS to try out some writing techniques during the Slice of Life Challenge in March! My slice today is actually several similar slices. You see, it’s Read Across America Day and I have the perfect excuse for doing one of my favorite things in the world: reading aloud to kids. I found myself invited (or self-invited) into classrooms from kindergarten to sixth grade with books that were both Seussical and non. I’m not sure who enjoyed these read alouds more, but it was a rush! I began with my kindergarten friends. When I introduced a book as, “one of my very favorite books from a very fun author”, they peppered me with “What is it? What is it?” As I held it up they cried, “He’s not a bunny! He’s a wolf!” I answered, “I know! That’s what Dot is trying to tell her family! Let’s see what happens!” They wrapped their blankets around their jammie-clad legs and snuggled up on their pillows while I brought Wolfie to life for them. They sat captivated, their emotions conveyed by an emerging smile or widening eyes. Not a peep except for the invitations for audience participation. I paused on the last page, letting the message and finality of the story sink in. And of course, what is the first thing out of most kindergartners mouths after a story? “Read it again!” I promised I would be back to read this and others, and when I asked them “What would you like to tell Ame Dyckman about her story?” almost all said, “She should write another one!” They wanted Wolfie at Christmas, Wolfie in Summer, Wolfie at Halloween …basically a Wolfie for all seasons! In room after room, I experienced such a similar audience captivation. I loved creating voices for characters, and pausing to let images and ideas saturate their minds. And all the while, I doubt that a motion sensor would have been triggered by these stilled listeners. Between pages, I would look out at their faces and see them transfixed, frozen mid-scene. This is like magic I thought, no…like hypnosis! I can’t show you the faces (I need to protect their privacy) but I bet you can transpose the sweet countenances of your own cherubs onto these heads. It is the look of enchantment, and the only charm needed was a wonderful book. So thank you, to Ame Dykman (Wolfie the Bunny), Theodore Geisel (The Lorax), Ryan T. Higgins (Mother Bruce) and Matt De La Pena (Last Stop on Market Street) for sharing your charms. You helped me mesmerize our students in magical ways and made these slices of my day so memorable!